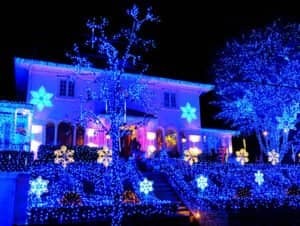 The Dyker Heights Christmas Lights tour is something you shouldn’t miss if you are in New York during the Christmas season. In New York, and especially Brooklyn, you can expect amazing over-the-top decorated houses, full of Christmas lights, reindeer, snowflakes and Santas. The area wildly celebrating this tradition is called Dyker Heights, it’s famous for the most beautifully lit and decorated homes. 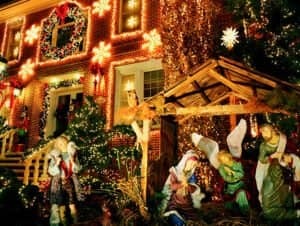 It’s brilliant to see this spectacle and a bus tour through Dyker Heights with a guide is the best way to find all exuberantly lit houses. 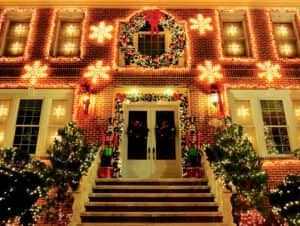 During this tour, you visit Dyker Heights and Bay Ridge in Brooklyn, two American-Italian neighbourhoods both battling for the glory of having the most beautifully decorated homes during the Christmas holidays. Hop on the bus in Midtown Manhattan and hop off again in Brooklyn to walk around with a guide and admire the marvellously lit houses. The benefit of taking this tour compared with exploring the neighbourhood on your own is the guide tells you all about the history of this Christmas tradition (it started with just one decorated home!) and he might even introduce you to some of the proud owners. Some of them hire companies for thousands of dollars to create the great decorations! After you’ve sampled Brooklyn’s Christmas atmosphere, the bus takes you back to Manhattan. You have excellent views of the skyline and the tour finishes at Union Square.